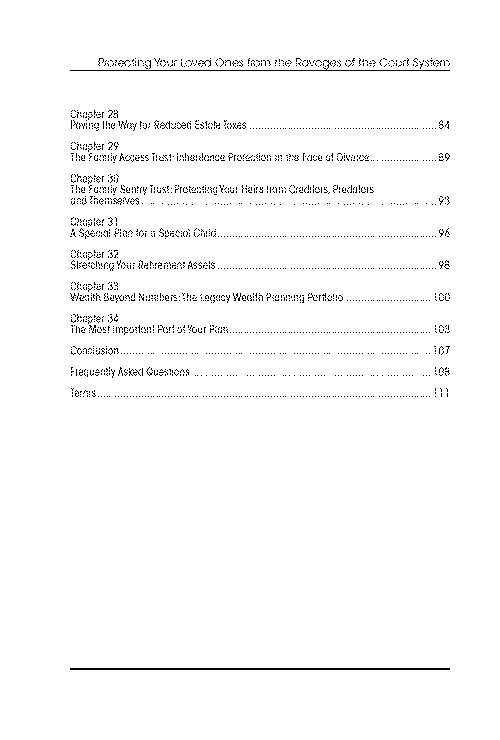 Legacy Wealth Planning: Protecting Your Loved Ones From the Ravages of the Court System. Most people are diligent about long-term financial positioning, but many of the same individuals completely ignore the subject of estate planning. This is a huge mistake, because a great deal can be lost if you do not craft your legacy properly. Of course, you won’t be around to see the results; your loved ones will have to accept the fallout. 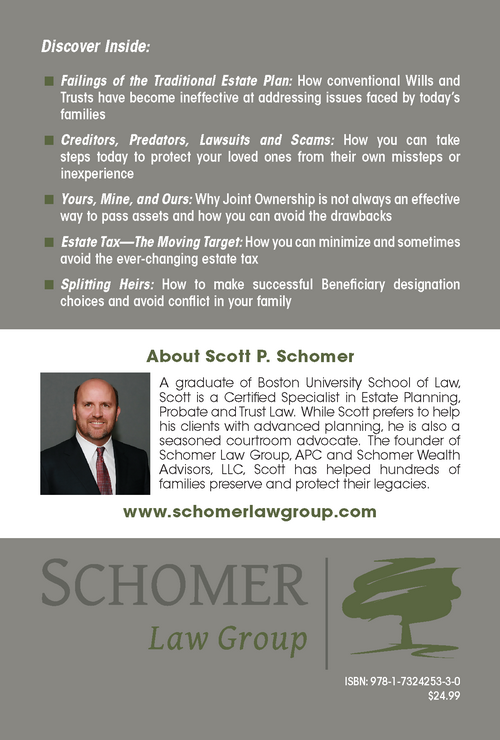 Estate planning attorneys like Scott P. Schomer make sure that their clients take the right steps to facilitate postmortem asset transfers in the optimal manner. 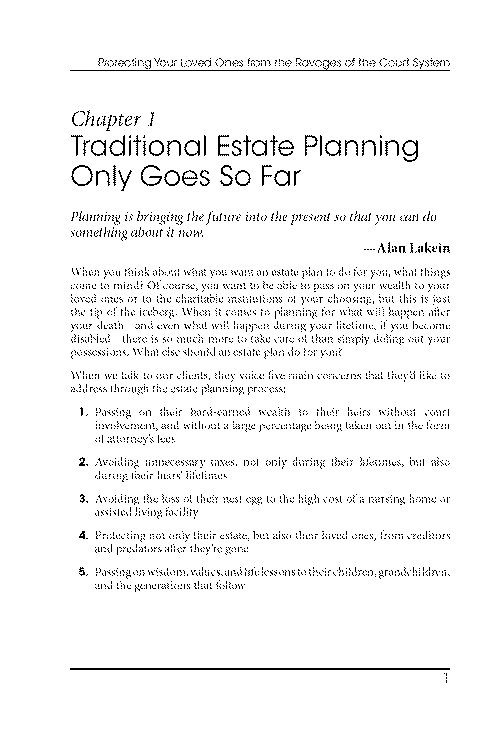 Each case is different, and the ideal estate plan will depend upon the circumstances. This is why personalized attention is key, and this is what clients can expect to receive when they work with the Schomer Law Group. When you fully understand the consequences of inaction, you see why informed legacy planning is so very important. 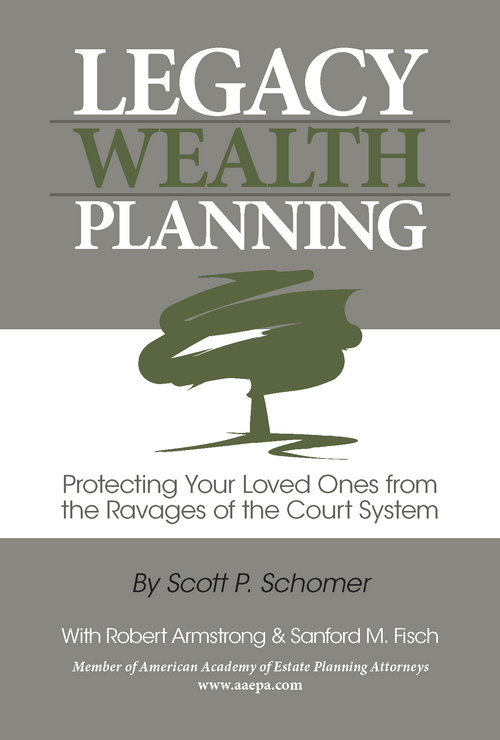 Attorney Schomer has written a book that spells out the different ways that your legacy can be ravaged if it is placed into the hands of the court system. This book breaks complicated legal concepts down into easily understandable terms, and it is getting stellar reviews. 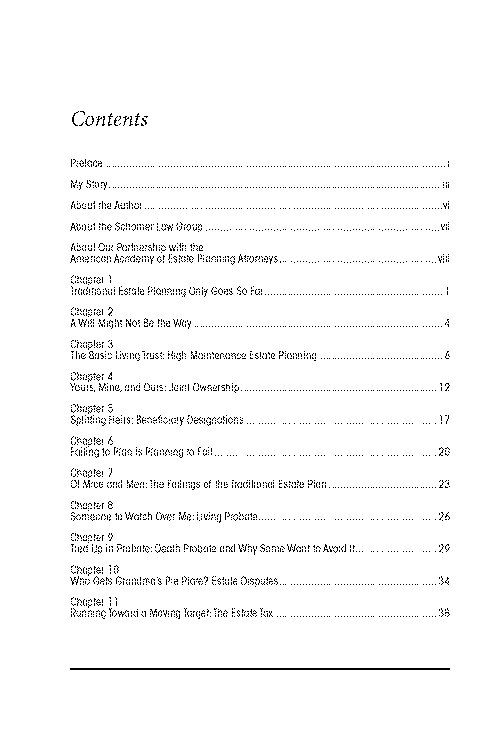 Scott Schomer is a member of the American Academy of Estate Planning Attorneys. This is a highly respected organization that has been educating legal professional since 1993. 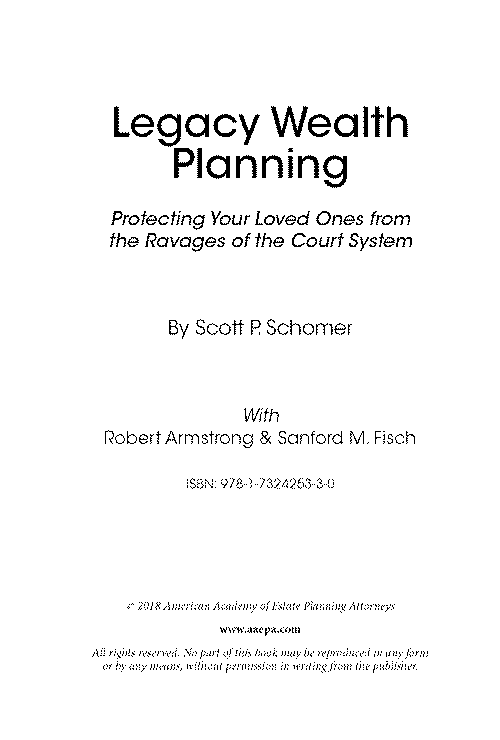 The founders of the Academy, Robert Armstrong and Sanford Fisch, are co-authors of Legacy Wealth Planning: Protecting Your Loved Ones From the Ravages of the Court System. If you were to pass away without any estate planning documents, the probate court would be called upon to determine how your assets should be distributed. After final debts are paid, the remainder would be passed on through the implementation of the intestate succession laws here in California. There are several drawbacks that go along with this process. 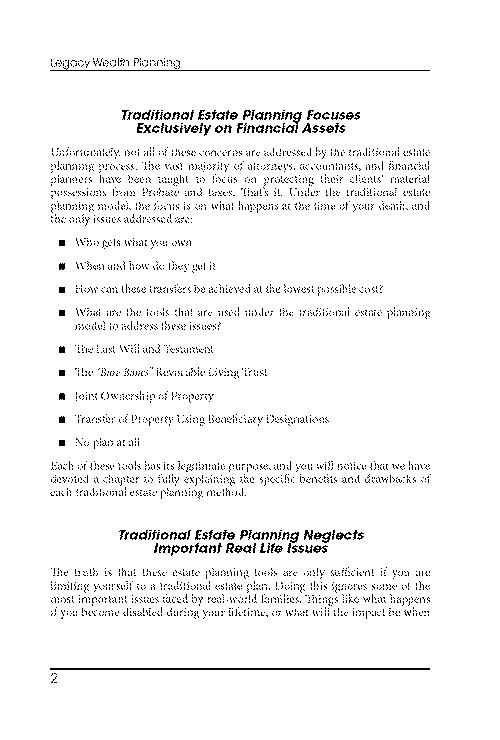 First and foremost, the way that the assets are distributed may not be consistent with your true wishes. Secondly, probate is time-consuming, and the heirs do not receive their inheritances until the estate has been closed by the court. 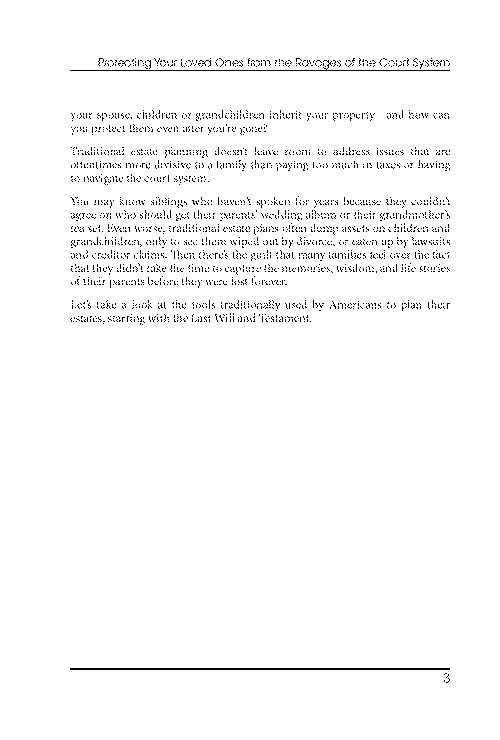 Lastly, considerable expenses accumulate during probate, and these debits reduce the value of the estate. The act of transferring everything that you have earned throughout your life to the people that you love the most is a profound endeavor. You should certainly take the time to consider your legacy very carefully, and the insight that is contained in this book will provide a foundation. 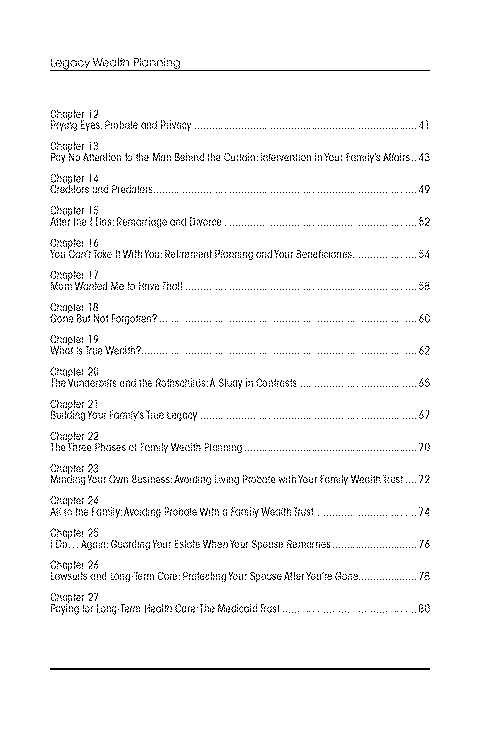 You can fill in your information below to request your copy of Legacy Wealth Planning: Protecting Your Loved Ones From the Ravages of the Court System. If you would prefer to give us a call, we can be reached at 310-337-7696 or 562-252-0577.